Two teams representing the ancient British universities of Oxford and Cambridge met over the board on the evening of Monday, December 30 as a side event to the London Open, with neither coming out on top. The two rounds constituting the match, in which each team fielded two alumni and two students of their respective universities, were both drawn 2-2. Accordingly, all players shared the champagne earmarked for the winners as well as each taking a £40 cash prize and the team sweaters worn during play. 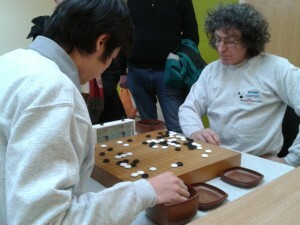 Both teams also took away a set each of the five-volume Learn To Play Go series of books by Janice Kim and Jeong Soo-hyun. Playing for Oxford were alumni Matthew Macfadyen 6d and Alex Rix 2d and students Jiang Junnun 4d and Stephane Thao 4k (who was given three stones) and for Cambridge, alumni Andrew Simons 4d and Chris Bryant 1d and students “Tony” Lou Yusiang 5d and Jamie Taylor 1d. Rix and Lou were the only players to win both their games. Games were half-hour main time, plus five minutes Milton Keynes overtime then five minutes sudden death. 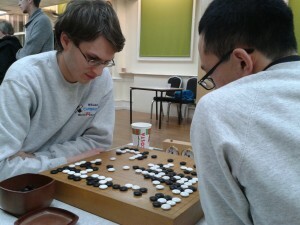 The match, which was broadcast live on the WBaduk site with the help of four volunteer BGA game recorders, was the first in what it is hoped will be an annual event, the WBaduk Varsity Match, and was sponsored by WBaduk — a South Korean government-backed website for the promotion of go worldwide — and organized in cooperation with the British Go Association (BGA). As well as the prizes, the sponsors also donated magnetic go sets, beginners’ books and T-shirts to both universities’ go clubs. The total budget for the event was $5,300. Organization on the ground was by Toby Manning of the BGA and Lee Semi, wife of London Open guest, top European-rated Korean player Hwang In-Seong, on behalf of WBaduk. For further details, including player profiles and game results, visit WBaduk’s event page. Tony Collman, British correspondent for the E-Journal. Photos – top: Tony Lou Yusiang (Cambridge, on the left) v Matthew Macfadyen; bottom: Andrew Simons (Cambridge, on the left) v Jiang Junnun. Banner graphic courtesy of WBaduk.